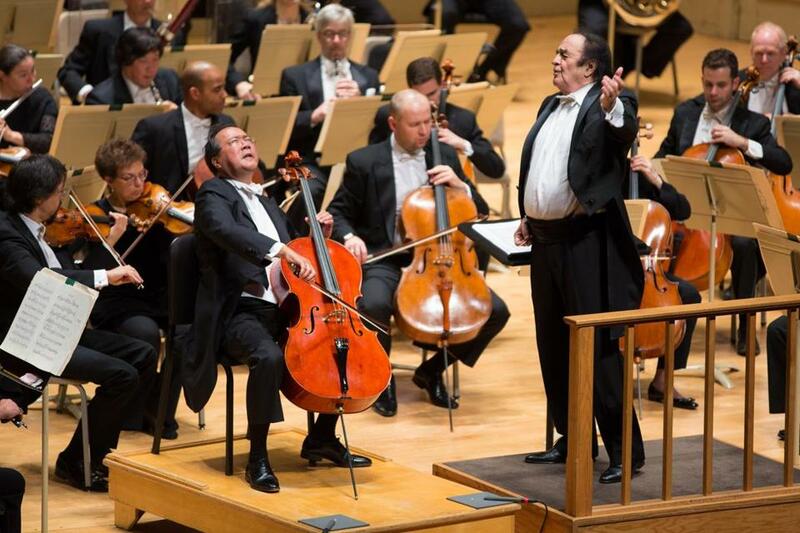 Charles Dutoit leading the BSO and Yo-Yo Ma in Elgar’s Cello Concerto. Charles Dutoit, one of the Boston Symphony Orchestra’s most acclaimed guest conductors, returned to the Symphony Hall podium on Thursday to begin a two-week engagement celebrating his 80th birthday. Occasion-wise, one could also note that this year marks the 35th anniversary of his debut with the orchestra. Dutoit’s affinity for French and Russian music leads many to think of him as a specialist in those realms. While there’s a modicum of truth to that, his repertoire is much more extensive, and the BSO has been wise, over the years, to allow him to roam through swaths of it outside that easy categorization. Thursday’s program was a telling example: It was an all-British affair, weighed heavily toward audience favorites. The sole rarity was William Walton’s “Portsmouth Point” Overture, making its first appearance on a BSO concert since 1941. It’s a bustling curtain-raiser whose irrepressible rhythms owe much to Stravinsky, while its bright timbres echo Ravel. Unsurprisingly for a piece of that lineage, Dutoit, who appeared quite spry for an octogenarian, was completely in his element. At the other end of the evening was “The Planets,” Gustav Holst’s seven-part suite on the astrological namesakes of the solar system. (Pluto, which had not been discovered at the piece’s composition a century ago, is omitted.) If the piece sounds to our 21st-century ears akin to extremely well-crafted film music, that is no slight to Holst; it is instead a measure of just how influential his skill at depicting character through instrumental color was. Between them was a magnificent performance of the Elgar Cello Concerto with Yo-Yo Ma. Coming up with new superlatives for Ma at this point may seem like an exercise in futility, but because the cellist never gives a routine performance of anything, there is always something different to appreciate. Here one could marvel at how he could in an instant change the texture, phrasing, and vibrato of a single note, and with it the music’s entire dramatic trajectory. Ma’s sense of when to take the spotlight, when to lay back, and when to play just above silence is unmatched, and it was fully evident in a piece where it is all too easy for the soloist to dominate. At times Ma was so engaged with the orchestra players around him that he almost seemed to be conducting as well. Dutoit, for his part, accentuated the darkness of Elgar’s scoring: the first movement sounded like a requiem for post-World War I Britain. Despite the concerto’s strong emotional pull, the music never devolved into simple sentimentality, even during the slow movement. It was only in the coda of the finale that the piece’s tragic dimensions came wholly into view, and Ma, Dutoit, and the orchestra made the final soliloquy into something noble yet unbearably melancholy.